First responders work the scene of a collision between a Greyhound passenger bus and a semi-truck Thursday on Interstate 40 near the town of Thoreau, N.M., near the Arizona border. Multiple people were killed and others were seriously injured. Editor's note: This is a developing story and will be updated as information becomes available. 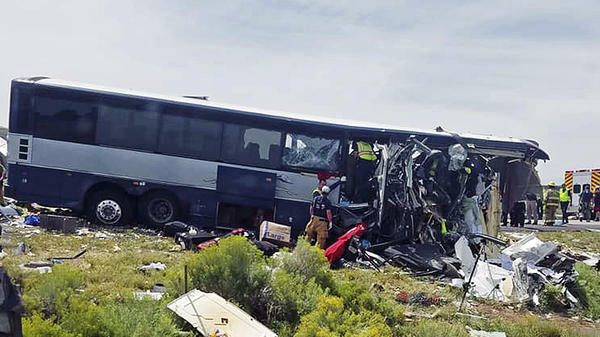 At least seven people were killed and dozens more seriously injured in a head-on crash between a semitruck and a Greyhound bus on Thursday in New Mexico, according to state police. The number of fatalities was raised from an initial confirmation of 4 deaths. "Many passengers with serious injuries were transported to a nearby hospital," the state police said on Twitter. The exact number of injuries is still under investigation. According to the New Mexico State Police, preliminary information suggested the semitractor-trailer was traveling eastbound on Interstate 40 about 100 miles west of Albuquerque, N.M., when one of its tires blew out. That appears to have caused the the driver to lose control and sent the truck careening across the median and and into oncoming traffic, where it rammed into the passenger bus. Video footage of the aftermath shows a gaping hole where the entire front end of the bus used to be. Meanwhile, the semitruck lies overturned across the center median and both lanes of westbound I-40, the contents of the trailer strewn across the road. "Our first priority is taking care of our passengers and their families, as this incident has deeply impacted all involved. Our thoughts and prayers are with everyone as we continue to give our support to all affected," Greyhound spokeswoman Crystal Booker told NPR in an emailed statement. Booker said 49 passengers, not including the driver, were aboard the bus, which was headed from Albuquerque to Phoenix, then Los Angeles. "People were trying to climb out of the windows of the bus," a witness told CNN. "Screams were coming from the bus. It was horrible."